THR was the first to break the news, which included a memo to Pixar employees. In it, Lasseter admits to having “difficult conversations” in order to address some “serious missteps” that have made people he worked with feel “disrespected or uncomfortable.” While he said that was “never his intent,” the face of Pixar apologized and said that he would be taking a six-month leave of absence in order to address the very personal issues in hopes that he can return a changed man. While Lasseter’s memo was vague on the details, THR says he is well-known for hugging his employees and others within the entertainment industry. 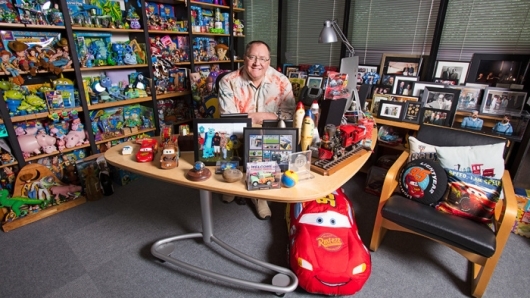 However, insiders say he was also known for “grabbing, kissing, making comments about physical attributes.” Women who worked at Pixar also turned their heads away from Lasseter as they encountered him, in order to avoid one of those “kisses.” He was also known to drink heavy amounts of alcohol during social events and premiere parties. Other allegations included a woman defending herself from Lasseter’s advances during a meeting in which his hands traveled up a female employee’s skirt. Other sources supported these claims, and some have gone on to say that photos of him had to be cropped. It’s not clear how many victims there are, but it is having a huge impact on Pixar projects. In the same report, it’s revealed that Rashida Jones and her writing partner Will McCormack, will no longer be a part of Toy Story 4, although they will still be credited as writers of the next installment of the Pixar franchise. Sources say the two left after Lasseter, who was returning to direct the fourth entry, made unwanted advances towards Jones. Jones and McCormack have yet to respond to these reports, and Disney has released a statement saying that the two left due to creative differences. The report also makes it clear that multiple sources spoke to the Hollywood trade, “but asked not to be named out of fear that their careers in the tight-knit animation community would be damaged.” Hopefully, with more and more victims coming out, these “sources” are able to speak out about these allegations publicly and not have to use anonymity out of fear of being blacklisted. No one should have to do that, let alone go through the horrors of being sexually assaulted. But at the same time, you have to understand why they are unable to share their names.